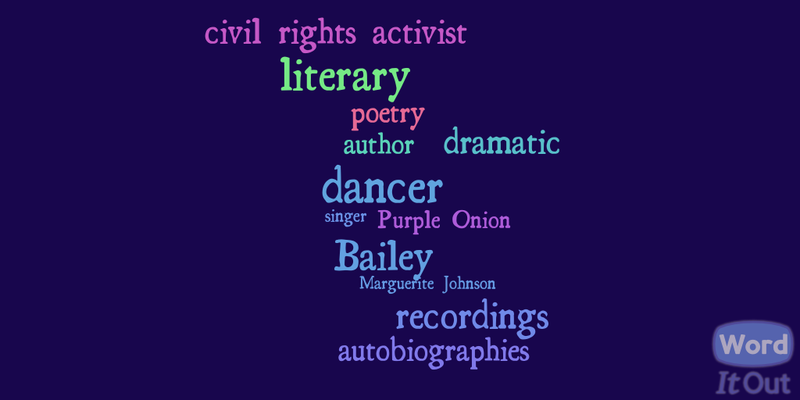 Written for the middle school reader, this biography of the award-winning poet and Civil Rights activist describes her early life raised by her grandmother in Arkansas. Rising from poverty, she achieved success as a dancer, an actress, a teacher, and an award-winning author. This compelling profile will make readers understand and appreciate why Maya Angelou is one of the best-loved and most fascinating American writers. Available in library, paperback, and eBook formats, this title is available from your preferred vendor, local bookstore, enslow.com, Amazon, and Barnes and Noble. Titles in the African-American Icons series are also correlated to the Common Core College and Career Readiness Standards. 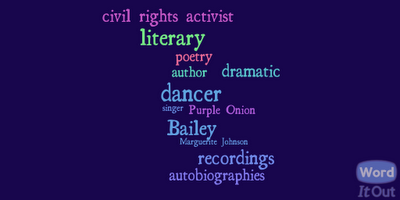 Did You Guess Maya Angelou from Our Word Cloud Clue? Click here to reserve your copies today. Pre-Orders also available from Amazon and Barnes and Noble.